Capital structure theory is too complex for a single blog post, but here are a few intuitive concepts blended with a little common sense. Many of the practitioners I talk with proscribe what is called the tradeoff theory of capital structure. In short, as the proportion of debt in a firm’s capital structure increases, two countervailing forces interact. First, firm value increases because of the value created by increased debt shields. However, increased leverage also increases risk and the cost of financial distress also rises with the level of debt. At some point, the advantage of the debt shields is offset by increased costs of financial distress. 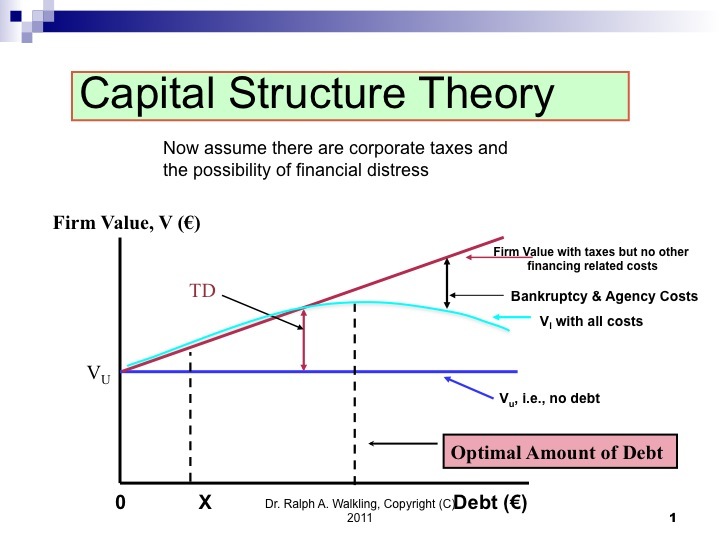 Thus, firm value increases with the proportion of debt in the capital structure, but only to a point. The chart below shows the basic idea. The Value of a firm with debt increases as debt is added to the capital structure but it only increases until we reach maximum value indicated by the top of the curve. This peak signifies the optimal capital structure for the firm. Beyond this point value declines as the costs of financial distress more than offset the value added by the tax shields. The exact point of this optimal structure varies with the nature of the firm’s business, the tangibility of assets and other factors. For some firms and deals, a mix of 30% debt and 70% equity might be optimal. It other situations these proportions could be reversed. The factors that go into these decisions are numerous and beyond the scope of a single blog. In practice, we often use ratios as a guide to optimal leverage. For example, we might ask if the ratio of EBIT to interest (the times interest earned ratio) is excessive, etc. One other thing to keep in mind in highly leveraged deals is that there is much that we don’t know. 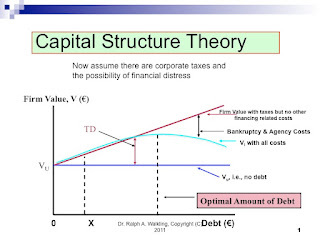 Many of the theoretical assumptions behind capital structure, for example, assume a linear relation between factors with tax shields and financial distress increasing linearly with debt. A bit of thought will suggest practical limitations: tax shields are only valuable if you are making a profit and certainly financial distress is unlikely to keep increasing linearly beyond some point. Beyond some tipping point, financial distress costs increase exponentially. Understand the forces that drive acquisition finance but use common sense as well - and remember leverage is a double edged sword that magnifies outcomes.